Hoover poses with a Thompson sub-machine gun at about the time he vowed to arrest Karpis himself. 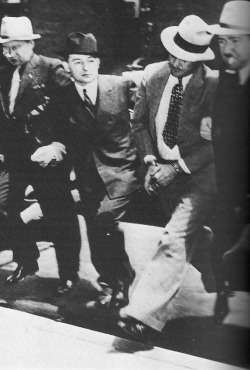 Harry Campbell (light-colored pants) is taken into court following his arrest on a wide range of charges stemming from his association with Karpis and others. During January and February of 1936 the FBI established phone taps on gamblers in Cleveland who knew Karpis, and the Bureau also set up a procedure to scan mail at a Cleveland post office for known aliases of Kapris and associates of the gang. Additionally, the FBI prepared a 56-page guide in alphabetical order listing names and addresses of approximately 200 people that knew Karpis in the past, and/or peripheral persons the FBI thought might have future contact with him. The depth of the investigation is made clear in a memo from Hoover to the field offices contained a section on Karpis’ habits: " ... good conversationalist, never calls person by correct name; refers to person by some place or incident (note: this trait evidently was to avoid implicating others in crimes). Smokes one pack of Chesterfield cigarettes per day; drinks canned beer and expensive whiskey; gets drunk; never talks when drunk; does not use narcotics; reads all newspapers; reads Detective Story and True Story magazines; desires female company regularly and likes to maul them; gambles-dice and poker; usually stays at tourist camp when traveling." Omitted from this memo, but known to the FBI, was the fact Karpis was an avid fisherman. 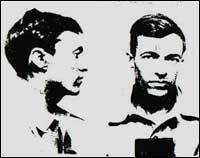 - Monty (Byron) Bolton, a Chicago mobster who had been part of the Barker-Karpis gang for the Hamm kidnapping and for other crimes. - George "Burrhead" Keady, an Oklahoma middleman who functioned as an intermediary between the gang and corrupt state officials. - John Brock, an accomplice in the November, 1935, train robbery. And there would soon be an unnamed informant emerging in 1936. During this period, Karpis and Hunter were staying in a cottage just outside Hot Springs, rented for them by Goldstein. And they might have actually been caught there (the FBI was in Hot Springs searching for Harry Sawyer), if it were not for Karpis’ sixth sense which kept him on the move. Hunter invited Keady to the cottage for drinks one day. After Keady left, Karpis immediately made plans to move. He wasn’t comfortable with anyone knowing where he was. Karpis’ instinct was correct again. 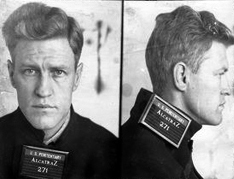 Keady, who may have been informing on gangs as early as 1935, had clearly become and informant in early 1936 when Tulsa, Okla., police, on a series of raids, found money from the Ohio train robbery in Keady’s safe, It had been given to him by a John Brock, a member of the gang, to change into clean bills. It didn’t take the postal people long to trace the money back to Ohio. They questioned Keady, who gave up Brock, who turn, told police about Edith Barry in Toledo, and her place being a traditional hideout. He also give details about the train robbery, and even about Karpis’ escape by plane from Ohio to Hot Springs. By March, 1936, the FBI had established that Grace Goldstein and Connie Morris were associating with Karpis and Hunter, but before they could locate the pair, Karpis and Hunter were again on the move. Within one or two days after Karpis and Hunter fled Hot Springs, an informant gave the FBI the location of the fugitives hideout on Malvern Road, about seven miles southeast of Hot Springs. The informant had given the agents a highly detailed outline of the terrain surrounding the house, and drew a sketch of it, and the raid was co-ordinated carefully. Among the raiding party were Special Agent E.J. Connelley, members of the "flying squad," several other agents from the FBI, postal inspectors, and a Kansas State policeman. About 20 lawmen in total. The agents hit the house in the early morning hours of March 30 with heavy firepower. They shot out the windows, doors, and even started a fire inside. Then it was discovered the house was empty. They had missed Karpis and Hunter by about 48 hours. It was another frustrating near miss, and embarrassing blunder, for Hoover. But one key piece of evidence was found inside the house. They found a map bearing the stamp Arrow Tourist Apartments, New Orleans.